8 foot tall lilies? Huge scented flowers? Tree Lilies are a variety of oriental lily that can easily grow higher than a man. Not only this, but they also produce huge quantities of enormous scented flowers. 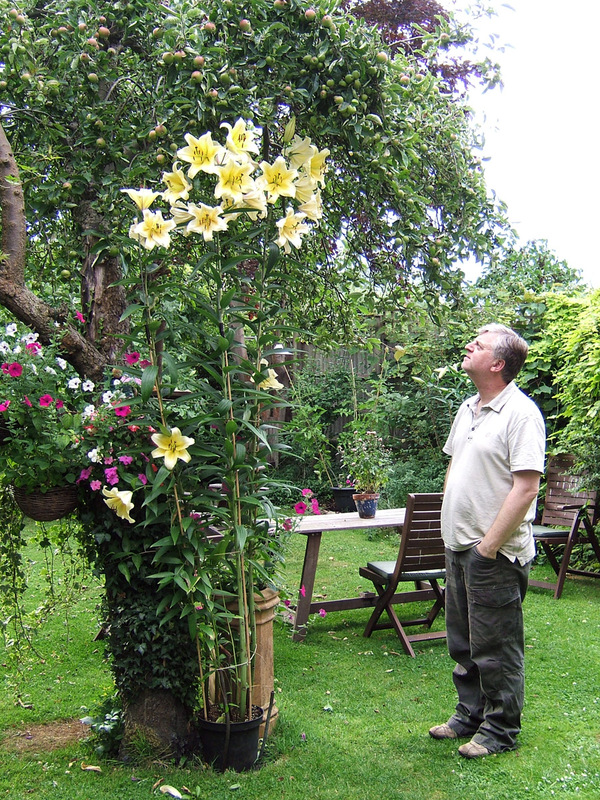 The picture above shows me with three bulbs of the tree lily "Manisa" in their second season growing in a 10L pot. 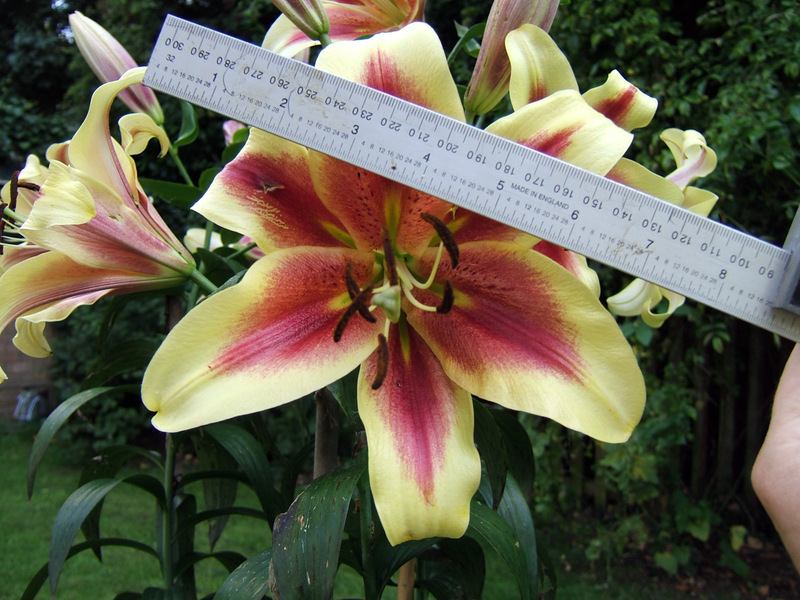 In the first season you can expect a bulb to produce a stem 4 feet+ (120cm+) tall with a few flowers on it, see picture below. 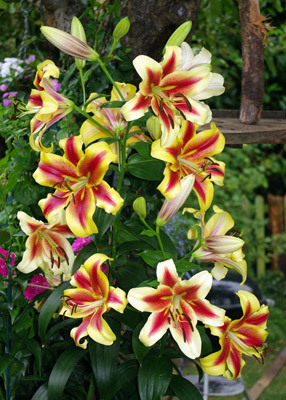 I grow mine in large containers rather than the soil as other lilies I've tried in my soil haven't done very well after the first year, so I recommend you start this way unless you know that lilies will do well in your soil. Growing in containers also allows you to move them around the garden bringing them to the fore when flowering and resting them out of the way when they have finished or when the flower buds are forming. Large containers are somewhat more exposed to frosts over the winter as the pots are above the ground and so the roots will get more frequently, and more deeply frosted than in the soil. In the cold winter of 2010/2011 I lost any tree lily bulbs that were outdoors. The ones that survived were those that I brought under unheated cover, sheltered from the worst of the winter. They also seem to respond well to being somewhat pot-bound, look at the size of those in the top picture compared to the size of the pot they are in! 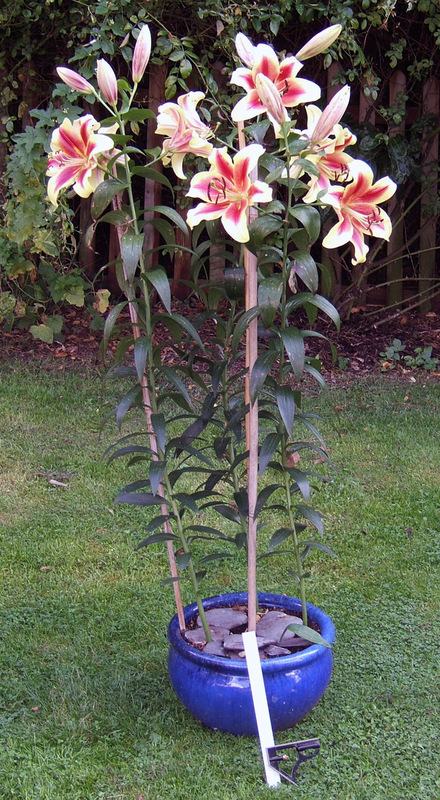 Plant in large containers with about 3L of compost for each bulb (three to a 10L pot for instance). Heavy ceramic containers will help stop them blowing over as they end up very top-heavy. Support the plants with bamboo canes as they grow, this also helps to separate them spreading the flowers apart so you can appreciate them better and giving each plant more space and light. Grow them with sun on the leaves and the roots in shade as far as possible. 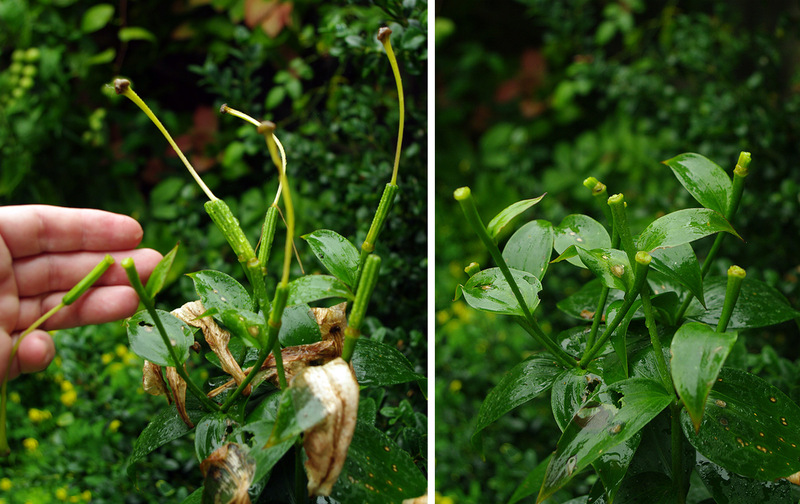 Place them somewhere sheltered if you can as those large flowers while quite stout can catch the wind which can damage the stems, especially when they are wet with rain. 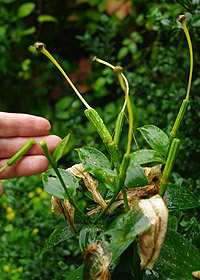 After flowering remove the remains of the flower head to stop them running to seed. At this point I move them somewhere out of the way a bit, but where they can still get enough sunlight. Make sure you feed and water them during this period as they are building up reserves for more fabulous flowers the next year. Bring them out of the way of the danger of frost and keep them dry over the winter. Don't be tempted to take the bulbs out of the pots as they will keep some roots and get off to a good early start the next year. 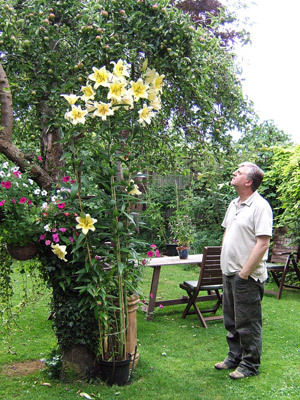 If you've kept them happy they will grow to 6-8 feet tall providing a real spectacle of blooms and scent. They will need some serious support to stop them blowing over. I use a metal rod about 2 feet long hammered through the pot into the soil, so about a foot in the soil of the pot, and a foot into the soil they are standing on. Two or three canes hammered around the pot complete the support. The canes will also need some support, I tie them to a tree or fence or similar as they are very precarious once in full bloom. Look after them like you did in the first winter, though this time they can be put into a larger pot, or separate out the larger bulbs from the many bulblets that will have formed. Start off again with three large bulbs and place the others into smaller pots to propagate them on.